Miami Boat Shows and New Location! Two Shows, One Weekend...and one new location! It's that time of year again! It's time again, to make your plans for the Miami Boat Shows. The Miami International Boat Show (Virginia Key) and Miami Yacht Show (formerly Collins Ave.), run concurrently, February 14 - 18, offering show goers an array of boats to see. There's surely something for everyone. We hope you didn't get too comfortable at Collins Ave! This year, the Miami Yacht Show has moved to its new location on Biscayne Bay, between the Venetian and MacArthur Causeways. We're excited to continue our display of the Bertram fleet, and new 61 at the Miami International Boat Show at the Miami Marine Stadium. The 5-day show runs Thursday, February 14 through Sunday, February 18. The boat show at Virginia Key provides convenient parking and transportation between the Miami Yacht Show, which runs concurrent - located between the Venetian and MacArthur Causeways. Here's a map to help familiarize yourself before the show, and enhance your experience! The new Raft Up app provides effortless access to parking and transportation options. 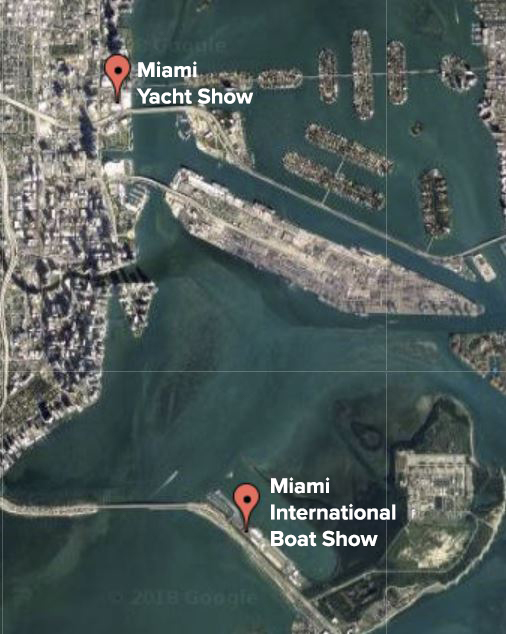 The Miami Yacht Show (formerly Yachts Miami at Collins Ave.), has officially moved to its new location on Biscayne Bay at One Herald Plaza, just North of Virginia Key, between Venetian and MacArthur Causeways. The show also runs Thursday, February 14 through Sunday, February 18. The new location is conveniently located just minutes from major interstates and just a Metromover stop away from the new Brightline Station. Richard Bertram Yachts will display two brokerage boats: 2004, 82' Horizon and 2008, 57' Bertram. Bertram and RBY salespersons will be present at the Miami Yacht Show, and will be happy to talk new boat sales, if you're not able to make it to the Bertram display on Virginia Key. Please don't hesitate to contact us with any questions regarding show schedule, sea trials, and all things Bertram.